As one of the famous Hannibal once said, “I love it when a plan comes together”. Now take the “plan” out of that quote and add “mixology and art” and you have a good explanation of what Kikekeller is all about. It’s a very stylish bar with all kinds of bizarre things from designer lamps and tables, to cups molded like pretty creepy babyfaces. Most of the things in this place are for sale, not only the drinks. Although the items from the art side of Kikekeller come at a slightly steeper price than if you want to have an Anchor Steam Beer from San Francisco, which I highly recommend that you try. 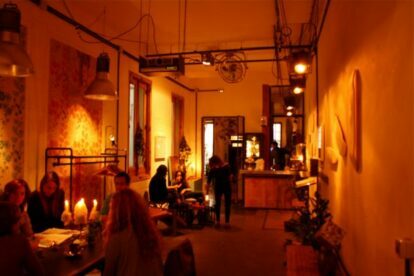 It’s a place where I’ve seen people of all ages go to enjoy their night so if you’re in the neighbourhood of Malasaña don’t hesitate to drop by, even if it’s just to look at the interior decoration. The front of the bar is an artshop that have slightly different timetables than the actual bar.